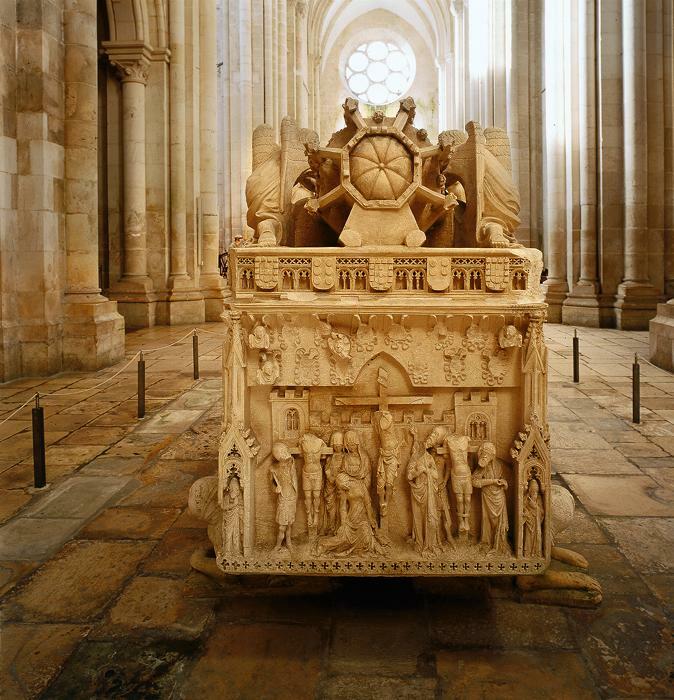 The tomb of Inês de Castro rests on six hybrid figures with human faces the bodies of beasts. The sides of the tomb are decorated with sculptured relief scenes from the New Testament, culminating in the head side with a depiction of the Crucifixion. At the foot end, the side features a representation of the Final Judgement in three registers along a sinuous line that starts at the mouth of Leviathan. Christ in his majesty presides over the Divine court. One can identify the Virgin Mary on her knees surrounded by angels and apostles and the miracle of the Resurrection. The recumbent figure of Inês de Castro wears a crown and her head and mantle are borne by four angels accompanied by two incense swinging angels. The top of the tomb is also decorated with the Portuguese crest and Castro family coats of arms.